But the next government will increasingly be faced with key decisions about whether to allow a handful of projects to proceed. Four major pipelines, in particular, have emerged in the campaign, some of which are more popular than others. While the Green Party is almost universally opposed to the projects and the Conservatives are almost universally supportive, each pipeline brings with it a bundle of environmental, economic and even cultural issues. In particular, the four pipelines have been an opportunity for the two center-left parties, Mulcair’s New Democratic Party (NDP) and Justin Trudeau’s Liberal Party to stake out contrasts against each other. 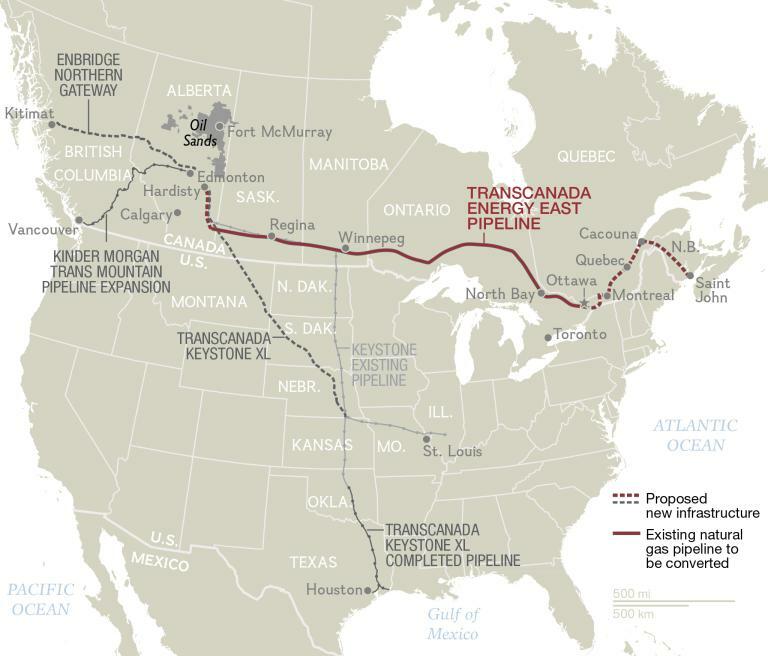 Energy East was first proposed in August 2013 by TransCanada, a Calgary-based public company that also hopes to complete the Keystone XL pipeline, and TransCanada applied for approval with Canada’s National Energy Board only in October 2014. 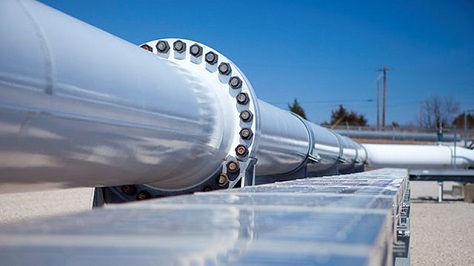 The project would convert a pipeline that currently ships natural gas from Alberta to Ontario into an oil pipeline, with a final plan to extend the pipeline from Edmonton all the way to St. John, New Brunswick on the Atlantic coast. If completed, the Energy East pipeline would be the longest in North America, and it is widely seen as an alternative to the Keystone KL pipeline, which has languished under review by US president Barack Obama’s state department. As a fresh alternative to Keystone’s expansion, a decision about the Energy East pipeline could be the most important infrastructure decision that Canada’s next government makes. But a minority government, in particular, might be wary of approving a project that will run through both of Canada’s most populous provinces, Ontario and Québec. In particular, Quebeckers have been more skeptical of the project, and a Liberal minority government might fear approving a project that would send Québec’s voters running back to a more critical NDP. While Mulcair and the NDP have generally opposed the project, the NDP’s reluctance may be fading. Alberta premier Rachel Notley, whose provincial New Democrats ended 44 consecutive years of Progressive Conservatives rule, supports the Energy East pipeline as a smart ‘within Canada’ alternative to the Keystone XL project. Mulcair has been less supportive, but he has nonetheless left open a path to supporting the Energy East pipeline with appropriately robust reviews for environmental impact and interference with First Nations property ownership. Trudeau, whose Liberal Party is leading polls nationally heading into today’s election, has been non-committal about Energy East, neither supporting nor opposing it. Last week, Trudeau argued that the project’s ultimate fate lies in the hands of the communities that will be most affected by it — both in terms of employment potential and environmental impact. Critics argue that Trudeau’s position is a cynical ploy to have it both ways, especially after Dan Gagnier, a Liberal campaign co-chair resigned last week when it emerged that he had provided guidance to TransCanada on how to lobby the next government for Energy East’s approval. Elizabeth May, whose Green Party is most consistently opposed to new pipelines, joked earlier in the campaign that it would be more useful to transport beer through Energy East, mocking the strict inter-provincial laws that restrict the sale of alcohol across provincial lines. If the Energy East pipeline would facilitate the export of Albertan oil to the eastern Canadian coast, the purpose of the Northern Gateway pipeline is to move Canadian oil to the Pacific coast, for export to China and elsewhere in Asia. Unlike Energy East, the Northern Gateway project, spearheaded by Enbridge, another Calgary-based publicly traded company, has been in the works since the mid-2000s, and it received approval from the NEB in 2014, albeit only after imposing 209 separate conditions on the pipeline. The twin pipelines would import natural gas condensate but export bitumen from Alberta’s oil sands to a terminal in Kitimat, British Columbia. Like all pipeline projects in Canada, Northern Gateway has drawn the ire of environmentalists and leftists. But it has also been most stridently criticized by First Nations bands. Aboriginal groups have been so reluctant about the project that Enbridge even offered participating groups a 10% equity share in the project to give First Nations bands a share of the profits to be placed in a trust for future development. Nevertheless, opponents could still derail the pipeline through an ongoing lawsuit in Canada’s appellate courts. Given the onerous conditions that the NEB placed on the pipeline’s approval, the potential of additional conditions demanded by British Columbia’s provincial government and any ultimate settlement with First Nations groups, there’s already talk that Enbridge is gradually abandoning the project. That possibility seems even more likely so long as oil prices remain depressed and China’s economy slows, lowering Chinese (and Asian) demand for Canadian energy. The project has already changed the course of British Columbia’s politics. When the 2013 provincial election campaign kicked off, the BC New Democrats held a 20-point lead against a tired BC Liberal government seeking a fourth consecutive term. After Adrian Dix, the BC NDP leader, announced his opposition to the Northern Gateway project, however, Liberal premier Christy Clark used the issue to argue that Dix would stymie the province’s development and growth. The strategy worked — Clark and the BC Liberals won the votes of conservative and centrist voters alike, and she emerged with an even stronger mandate for the Liberals. That hasn’t changed Trudeau’s longstanding opposition to Northern Gateway as Liberal leader, however. Among the four major pipeline projects, none has such sustained and consistent disapproval as Northern Gateway, supported only by Harper’s Tories. Kinder Morgan, a Houston-based public company, has also proposed expanding its Trans Mountain pipeline to triple the flow that currently runs from Edmonton to just outside of Vancouver, and it applied for NEB approval in 2013. Like Northern Gateway, however, Kinder Morgan’s pipeline expansion has attracted scrutiny and resistance from First Nations groups, environmentalists and other groups. For example, the pipeline currently flows through the Strait of Juan de Fuca, and environmental activists worry that a pipeline spill would be particularly detrimental. Notley, whose support will be crucial for any pipeline’s progress, has been much more complimentary of expanding Trans Mountain than of building Northern Gateway. In the aftermath of her election in May, Notley said her government would take a ‘hands-off’ approach to Enbridge’s project, given the myriad environmental, aboriginal and other challenges to Northern Gateway. She has been far more complimentary of the Kinder Morgan project. See, here’s the difference. Opposing these pipelines systematically in advance is just as wrong as supporting them… in advance, because, in both cases, what you need is an objective study. Of course, for Americans watching the outcome of the Canadian election, the most accessible pipeline debate has to do with Keystone XL. The NEB approved the original Keystone pipeline in 2007, and three of four Keystone phases have already been completed. The first-phase pipeline travels from eastern Alberta eastward to Saskatchewan, then rolls south through the Dakotas to the Nebraska-Kansas border, then turns east to Illinois. The second phase extended the pipeline from Steele City, Nebraska, south to Cushing in northern Oklahoma. The third phase extended the line southward to Port Arthur, Louisiana (and a connecting line to Houston will be completed later this year). The controversial ‘XL’ phase would build a direct southeastern line from Alberta to Nebraska that runs through Baker, Montana. It’s this final, fourth phase that is caught up in the Obama administration’s deliberations for so long. Despite Harper’s boisterous advocacy, the Obama administration has been reluctant to approve the Keystone XL pipeline, for which TransCanada applied for a license in 2008 from the US state department. Though Obama vetoed a Congressional bill earlier this year that would have pushed forward with the project, the US president could still conceivably approve it in the final months of his administration. But if, as seems most likely, Canada wakes up to a minority government, Keystone XL might wait until the end of the decade — or at least until a new US presidential term. Hillary Clinton, the former US secretary of state, came out against the pipeline in late September after months of consideration. But in the United States, where Keystone XL has become trapped in partisan gridlock, a Republican administration might be quick to approve the last phase of the project. Trudeau broadly supports Keystone XL, and he has indicated that’s willing to work with the US government to allay any environmental issues. Moreover, he’s criticized Harper’s tone on the Keystone XL pipeline, arguing that it has chilled US-Canadian relations. Mulcair has consistently opposed Keystone XL, and he argued that all progressives in the United States and Canada oppose the pipeline, on the basis that it would export Canadian jobs to the United States.